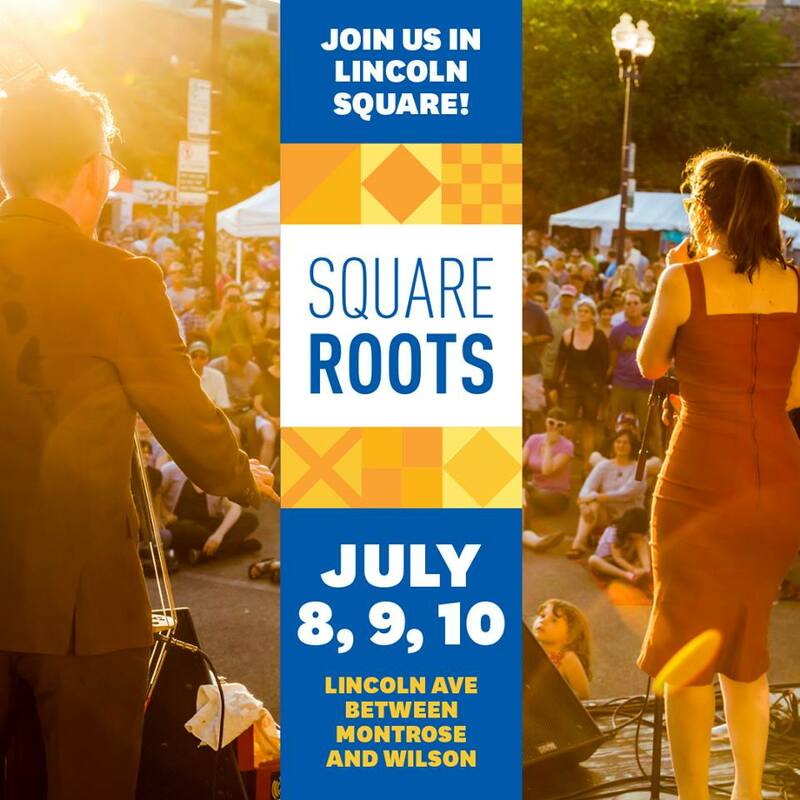 This weekend ChiIL Mama will be ChiILin' on Chicago's north side at the annual Square Roots Festival in Lincoln Square. Although we're still nostalgic for the defunct Old Town Folk and Roots Fest, Square Roots is a standout among street fests, with world class music and plenty of family friendly fun. The one-of-a-kind craft beer and music experience, returns July 8-10 with more than 50 acts on 4 stages, and 30 regional craft brews paired with Lincoln Square’s finest restaurants and local artisans. Presented by the Old Town School of Folk Music and the Lincoln Square Ravenswood Chamber of Commerce, the three-day festival will feature music, dance parties, participatory jams and plenty of family fun activities. Dates: Friday, July 8, 5-10 p.m.; Saturday, July 9, noon-11 p.m.; Sunday, July 10, noon-9 p.m. Proceeds from Square Roots support both Old Town School of Folk Music and Lincoln Square Ravenswood Chamber programs, including music education scholarships, local shopping initiatives, ongoing community events and public farmers markets, as well as free summer concerts and artist-in-residence programs at Chicago Public Schools. Festival goers can expect multiple music stages, both inside the Old Town School and outside on Lincoln Avenue, programmed with an eclectic and vibrant mix of performers from local indie rockers to world music stars to Old Town School teaching artists and students. Musical acts include Cracker, best known for its gold-selling 1993 album, Kerosene Hat, which includes the hit songs "Low" and "Euro-Trash Girl.” Other acts include Lydia Loveless, Dale Watson, Debo Band, Lera Lynn, and Sarah Jarosz. Click HERE for the full line-up of performers. In addition to great music, Square Roots is proud to be one of Chicago’s best craft beer destinations. The festival features the best local and regional craft breweries with a wide variety of styles and flavors. With special tappings throughout the festival, there’s something to quench every type of thirst. Several popular Midwest breweries will have a presence at Square Roots including 5 Rabbit Cerveceria, Arcade Brewery, Empirical Brewing, Founders, Half Acre Beer Company, Hinterland Brewery, Lagunitas, Metropolitan Brewing Company, Northman House Cider, Penrose, Revolution, Sketchbook Brewing, Temperance Brewery, Ten Ninety, Tocaya, and Two Brothers. The full beer list can be found HERE. Lincoln Square’s restaurant scene will also be on hand serving up amazing dishes for guests to enjoy with the craft beer pairings. Participating restaurants include Gather, Byron’s Hot Dogs, Bistro Campagne, Bo’s Concessions, El Campeon LLC, Feed Your Head LLC, Groundswell Coffee Roasters, LC Pho Restaurant, Mash Kitchen, Taco in a Bag, The Budlong, and The Grafton. Click HERE to view a full list of menu offerings. Square Roots is proud to welcome nearly 35 market vendors to this year’s festival, all based in Illinois and nearly half from the Lincoln Square neighborhood and surrounding areas, making it a true community event. Shop unique items such as Tori’s Bitty Bows, Cranky Pickle, Native Arts and J Jewelry Design. Click HERE to view a full list of market vendors. With the Old Town School of Folk Music leading the entertainment, there will lots of reasons to twist and shout. From Wiggleworms for the little ones to multicultural dance performances to open, participatory jams as the day rolls into night, Square Roots is perfect for families. Bring the whole crew by for a Family Barn Dance with kid performers; sing along with the Doodle Bugs and Karoke with Kids! Click HERE for all the family friendly fun. The Old Town School of Folk Music, considered the largest community school of the arts in the United States, teaches and celebrates music and cultural expressions rooted in the traditions of diverse American and global communities. Founded in 1957, the Old Town School offers classes in music, dance, theater and visual arts that span a wide range of artistic genres, presents over 400 concerts in two intimate and acoustically superb concert halls, and supports artist-in-residence programs in underserved Chicago Public Schools. The Old Town School owns and operates three Chicago facilities – two situated in the Lincoln Square neighborhood and one in Lincoln Park. Facilities include 425-seat and 150-seat concert halls, 51 classrooms, two music stores, a cafe and a resource center. The School also offers its popular Wiggleworms® program at four suburban satellite locations. For more information on the Old Town School of Folk Music please visit oldtownschool.org or reach Dave Zibell, Director of Marketing atdzibell@oldtownschool.org. Founded in 1948, the Lincoln Square Ravenswood Chamber of Commerce is a professionally staffed not-for-profit association of approximately 300 local businesses, institutions, and professionals. In March of 2011, the U.S. Chamber of Commerce awarded the Lincoln Square Chamber of Commerce a 3-Star Accreditation. This prestigious honor puts the Lincoln Square Ravenswood Chamber of Commerce in the top 3% of all Chambers nationwide. The Chamber is organized to focus attention and initiate action on the major issues affecting the economic well-being and quality of life in the area. The Lincoln Square Ravenswood Chamber of Commerce assists Chamber members with strategic planning, marketing, networking, and provides advocacy, training, area planning, and development. They sponsor more than 75 days of special events for neighbors each year and also serve as a resource to tourists, visitors and residents. In addition to this, they manage the day-to-day programs of the Lincoln Square Business Improvement District (SSA #21) and the Lincoln Square Foundation - a 501(c) 3 charitable organization.